Good morning! 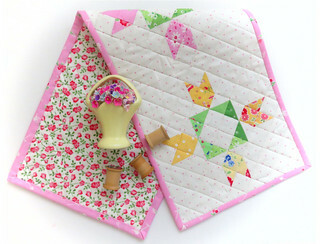 It's my turn again to show another block for the Quiltmaker's 100 Blocks sew along! 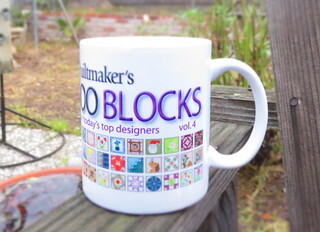 I'm starting the day drinking coffee from my Volume 4 mug, which is the magazine this block was featured in. The super exciting thing about this volume was that my name was on the cover. I am still totally thrilled about it. I've had so much fun dreaming up blocks and submitting them to Quiltmaker and I appreciate that I have had blocks in all the 100 Block magazines so far. My block, Round Rosie, has spring tulips in a circle. Here's what I cut for my little runner of three blocks. I'm ready for spring with these colors. I made three blocks and set them on point for a small runner. I did some speedy grid quilting and bound it with a nice springy pink garden print. I love it! Perfect for these gloomy winter days. 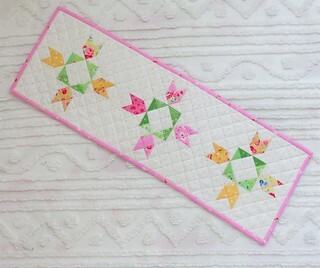 If you want to make this runner you can make three 6 inch (finished) Round Rosie blocks, add 4 setting triangles from a 9 3/4" square cut twice diagonally, and 4 corner triangles from two 5 1/4" squares cut once diagonally. Binding just takes two 2 1/2" strips cut from the width of fabric. Easy peasy. 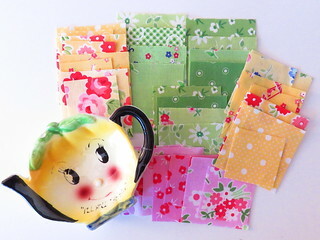 You can read all about today's stop on the hop over at the Quilty Pleasures blog. Check out my original post about being in Volume 4 here! Pam, that is amazing - a block of yours in each of the 100 Block Magazines so far!! That is pretty special!! I'm not a designer. I can make a quilt 'smaller' by changing the size of the sashes, and using less blocks, but I am definitely just a 'processing' person. So I'm very appreciative of all who can design the beautiful patterns. Thank you for being one of those special designers.